Anyone who’s ever had to move will tell you the same thing: moving is a huge pain and not a fun experience. However, there are ways to make moving easier on yourself, and the biggest way to do so is to not take everything with you — that’s right, moving is infinitely easier when you don’t keep all your stuff (because chances are you don’t need it all). Here are some items you won’t need to take with you to your next apartment and can get rid of to make moving less of an ordeal. 1. Books (specifically, textbooks). After a semester’s over, you most likely go on break and come back to school and get the textbooks you need for that semester’s classes. But what about your textbooks from past courses? Books are super annoying and heavy to move, especially if they’re textbooks you have no intention of ever opening again (or in the first place). Rather than just getting rid of them, you can try selling them to your local bookstores — which often buy and sell used books — or try posting them online to sell directly to other students. 2. Clothes. Pretty much everybody has clothes in their closets and drawers that they don’t wear. So why bother moving them to your next apartment if you’re not going to wear them while living there either? Before you move, go through your clothes and get rid of the clothes you don’t really like, that don’t fit, that don’t make you feel good, and that you’re not going to wear. Better quality and name-brand clothes you can try selling to places like Plato’s Closet to earn some cash and the rest you can donate to places like Goodwill or the Salvation Army. 3. Furniture. 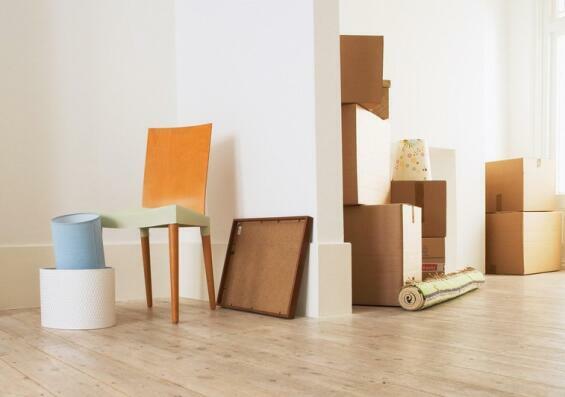 Moving furniture — or storing it — can sometimes be just as expensive as buying new. 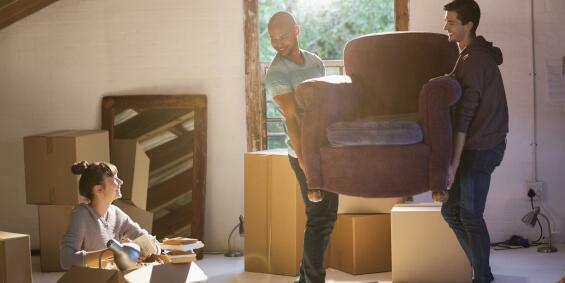 When moving, consider if you really love whatever furniture you have and what condition it’s in. If your furniture is not worth moving, you can always sell it to other students directly or online and buy or rent new furniture for your new apartment. As long as you’re getting new digs, you might as well have good furniture to go in it. 4. Rugs. Moving a rug that’s been in your dorm or apartment for a while isn’t really worth the effort if it’s not in good condition. Chances are it’s pretty dirty, possibly stained, and even vacuuming and whacking the heck out of it isn’t going to restore it to its initial glory. You might as well sell (if possible) or pitch the rugs you’ve currently got and buy new or rent rugs to go in your next apartment. 5. Free promotional stuff. You know those days towards the beginning of school when your college hosts a day in which you get lots of free stuff and then how most of said free stuff isn’t ever actually used or useful? Yeah, so you’re going to want to pitch all those promotional plastic cups, random foam balls, crappy plastic sunglasses, and other assorted free junk you picked up and then discarded somewhere. That stuff doesn’t need to make the move with you to your next apartment so you might as well get rid of it all now. 6. Extra towels. Obviously, you need towels — but many students seriously bring way too many towels when moving into a dorm or apartment and those can take up a lot of room when moving. Unless you’re going to use them to help protect some more fragile stuff in the move, donate them to an animal shelter or some other place that can use them because they’ll just take up room you’d rather be using for something else. Plus, getting rid of some of your towels may make you do more laundry more often. 7. Cheap posters and artwork. Unless you’ve got some really awesome art you splurged on, made yourself, or that has sentimental value, you should probably not be moving your artwork and posters. It’s super inconvenient to protect while moving and chances are you can replace them, improve them, or don’t really care all that much about whatever’s on your posters or in your pictures anymore. Keeping them safe while moving is almost impossible so if it’s cute wall art from Target or something you think someone else may like, you should try selling it online before moving — that way you’ll make some money to help buy some new art for your next place. So whenever you’re moving, consider getting rid of these things before doing so — it will make your move a lot easier and allow you to deck out your new place with cool new things and less clutter.